Mark Lewisohn (born 16 June 1958) is an English author and historian, regarded as one of the world's leading authorities on the English rock band the Beatles. 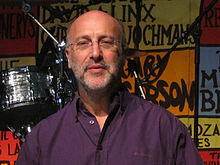 Over the course of his career, Mark Lewisohn has worked for EMI, MPL Communications and Apple Corps, and has written many reference books about the Beatles. He has been referred to as the world's leading authority on the subject, renowned for his meticulous research and integrity. Lewisohn is Jewish. In 1986, Lewisohn's book The Beatles Live! was published. This featured a complete history of all the Beatles' live performances, in a format which Lewisohn would follow for his subsequent books. After being invited by EMI to listen to all of the Beatles' original session tapes, Lewisohn wrote The Complete Beatles Recording Sessions: The Official Story of the Abbey Road Years, which was published in 1988. The book was in the form of a diary, listing chronologically every recording session the Beatles had at Abbey Road Studios. It included details such as who played on each track and how many takes were recorded in each session. The book featured an introductory interview by Paul McCartney. Lewisohn's next book, The Beatles: 25 Years In The Life, was published in 1988 and included information on what each individual member of the band was doing on any particular day between 1962 and 1987. This book was republished as The Beatles Day by Day in 1990. The Complete Beatles Chronicle was published in 1992 and went one step further, detailing the band's entire career in the studio, on stage, and on radio, television, film and video. Lewisohn's next book was The Beatles London, which he co-authored with Piet Schreuders and Adam Smith, published in 1994. This is essentially a guide book to all the Beatles-related locations in London, including Abbey Road and the London Palladium, featuring maps and photographs of the band at the locations mentioned. A revised version of the book was published in early 2008. According to Daniel Finkelstein, writing in The Times in 2014, Lewisohn was responsible for identifying comedian Jasper Carrott as the source in 1983 of the famous remark, "Ringo isn't the best drummer in the world. He isn't even the best drummer in the Beatles." This observation has generally been attributed to John Lennon, but Lewisohn had been doubtful because he could find no record of his having said it and thought it was out of character for Lennon to say something that he did not actually believe, though he was also well known for making mischievous remarks. However, Lewisohn has since confirmed that the line actually originated in a 1981 episode of the BBC radio comedy series Radio Active, written by Angus Deayton and Geoffrey Perkins. Volume 1 was published in October 2013, entitled The Beatles: All These Years, Volume One – Tune In. Lewisohn was quoted as saying "It took longer to research and write than I could ever have anticipated". In an interview published on 28 December 2013, Lewisohn estimated that the second volume would be published in 2020 and the final volume in 2028 ("about the time he turns 70"). In the past, Lewisohn has written for magazines, including the Radio Times and Match of the Day. He also helped to edit the book Hendrix: Setting The Record Straight, written by John McDermott and Eddie Kramer. ^ "Travels In Music: Ep. 1: The World's Leading Beatles Historian, Author of 'Tune In' Mark Lewisohn". Travels In Music. ^ Empire, Kitty (20 October 2013). "The Beatles: All These Years, Volume One – Tune In by Mark Lewisohn – review". The Guardian. Retrieved 25 October 2013. ^ Whiting, Tim. "Q&A with Mark Lewisohn". MarkLewisohn.net. Retrieved 7 November 2013. ^ Kozinn, Allan. "Tune In, and Turn on the Reading Light". New York Times. Retrieved 31 December 2013.